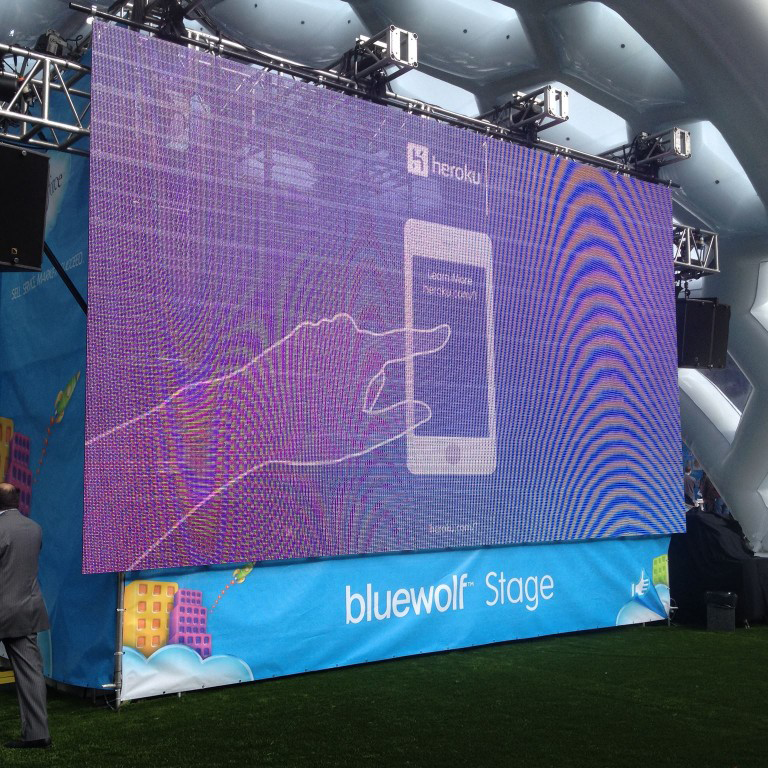 BKW helped create an array of ads for Heroku at Dreamforce, a conference attended by 140,000 people. Heroku is an app-building platform and Y-Combinator graduate acquired by Salesforce in 2010. 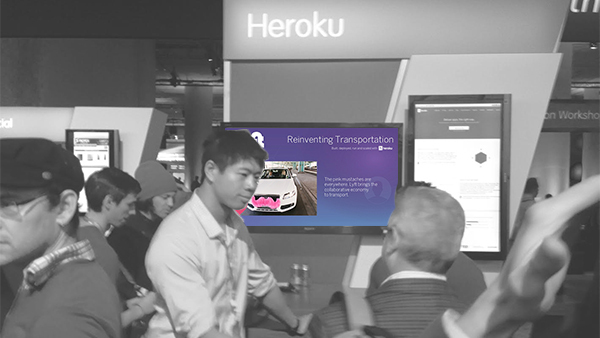 The BKW team came on board with Heroku in the months leading up to the Dreamforce event, and helped them with their core brand positioning and messaging. 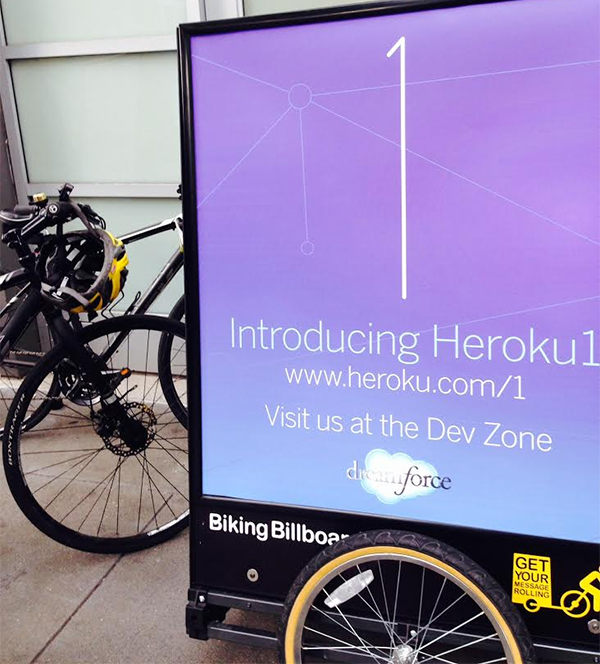 Heroku had a booth front-and-center at the entrance to the popular Dev Zone — where the Salesforce $1,000,000 Hackathon was taking place. BKW created this silent, looping animated video that entertained and informed during show hours. To complement the goings-on at the booth, the team created a series of animated digital ads that played throughout Moscone Center, as well as at hotels throughout the area holding Dreamforce sessions. We also managed the design and production of a brochure and organized bicycle billboards through a partner in Seattle (BikingBillboards.com) we brought down for the event. They kept a constant, purple, presence on the streets around Moscone Center handing out brochures and directing visitors to the Heroku booth. Thank you to BKW Creative Net member Byron Louie for his help with this portion of the project! Finally (and thank you RCN member Aaron Adiego) we helped the Heroku web team with creating responsive code for the heroku1 landing page so it looked (and worked!) awesome on mobile devices.